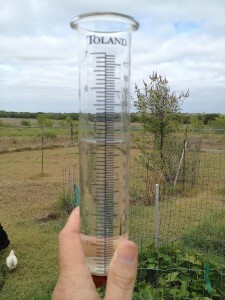 This was my rain gauge last Sunday, showing the total up to that point. It’s hard to believe that Friday, a week ago, the ground was bone dry and some formerly grassy areas in our yard were becoming patches of dirt. I was watering the back yard just to keep the grass alive in the area where my granddaughter plays, knowing that sooner or later the rain would return. A few days later and everything is green and growing. 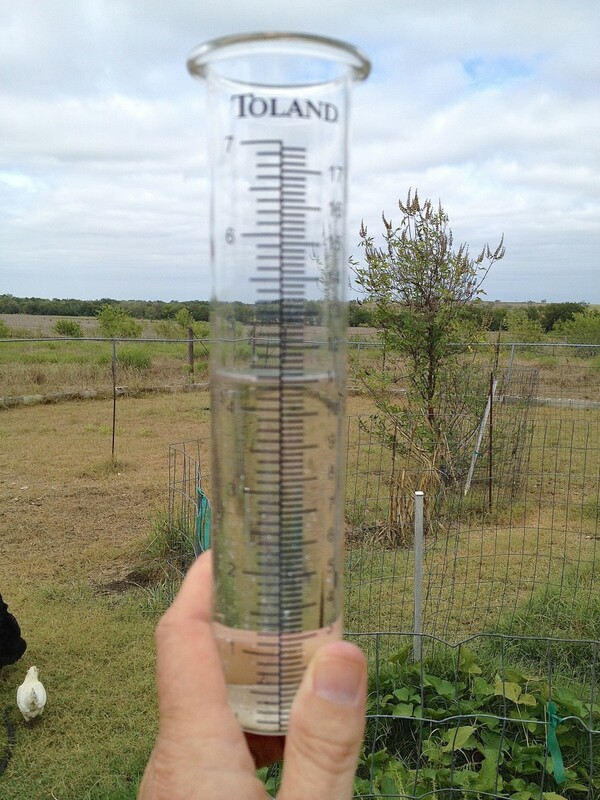 I emptied the rain gauge a few times. We had 4.3 inches follow by 0.3, then 2.0 and finally 4.0 for a total of 10.6 inches in one week! Even the areas under the barn that had no direct rain or drainage flow are soft and muddy. Night time is filled with frog song. Water is a wonderful thing! This entry was posted in Weather, What's New? and tagged Coupland Texas, rainfall on September 20, 2014 by Stewart Dale Spencer.